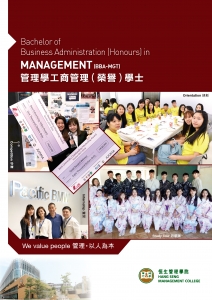 Two BBA-MGT Year 4 students Lydia Chan and Vicki Tsang (as well as other two teammates) won the Gold Award Winner and the Best Advertising Video Award in the Joint University Outstanding Marketing Award (JUOMA) 2017-2018, outperforming a total of 388 teams of rivals from universities and colleges in Hong Kong. This micro-movie is produced and shot in The Hang Seng University of Hong Kong (HSUHK), directed and starred by our students. Any resemblance to actual events or persons is entirely coincidental. The Bachelor of Business Administration (Honours) in Management (BBA-MGT) pledges to provide a state-of-the-art study programme in management. BBA-MGT provides students with plenty of opportunities to learn and experience business and management skills through formal training and student activities. The well-rounded curriculum enables them to become a well-rounded person and sharpens their competitive advantages in the rapidly changing work environment. BBA-MGT requires students to take minimal yet essential core modules, while they can choose a variety of elective modules from different disciplines. As such, they may explore general business areas or focus on narrow business niches, according to their own interests and career aspirations. The BBA-MGT Programme is internationally recognised and accredited by the Chartered Professional in Human Resources Canada and granted exemptions from the CPHR National Knowledge Examination in Canada. Form 6 graduates with Level 3 or above in Chinese Language and English Language, Level 2 or above in Mathematics, Liberal Studies and one other subject in the Hong Kong Diploma of Secondary Education Examination (HKDSE). The requirements for HKALE, IB, mature students, advanced standing and other non-local qualifications are comparable to other recognized post-secondary institutions and universities in Hong Kong. Bachelor of Business Administration (Honours) in Management is recognized under the Qualifications Framework (QF).